Whether your smartphone is an iPhone or Android phone, there's one thing all smartphone users can agree on: our batteries don't last nearly long enough. Even as our smartphone batteries have gotten bigger, larger screens and more demanding apps mean battery life has remained in the "disappointing" range. Considering how much we rely on our smartphones, it's no wonder that we're all carrying around charging cables and backup batteries. Some of these apps are the ones we'd expect to be big battery drains. For example, if you're using Spotify to stream music, you would expect it to use up battery life to run and burn up data to stream. But certain apps are a real surprise, like The Weather Channel app. This seemingly innocuous app is constantly checking on the latest weather, which creates a constant drain on battery and bandwidth—ouch! The first three are automatically installed on select Samsung smartphones, and they're the names you're least likely to recognize. Link lets you access multimedia content on other Samsung devices from your smartphone, Security Policy Update helps keep your phone secure and Beaming Service lets you send barcodes (as on tickets or coupons) from your phone to barcode scanners. If you don't regularly use any of the apps on this list, it may be time to uninstall them to give your battery a boost. And remember that you can easily access Facebook from a mobile web browser and get updates whenever you want—without Facebook always running in the background. Media streaming apps Spotify and iPlayer aren't a shock to see here: constantly streaming data to play takes a lot of power. Samsung's WatchON remote control app may seem surprising... until you realize once you turn it on it remains running in the background. The longer you're using any of these apps, the more power they'll gobble up! So just what can you do to keep your battery going after a long day—other than stay tethered to a power outlet? Your first step is to ditch the apps you don't use (especially if they're on this list). After that, it's time to consider which apps you really need to run, because some will always be power drains—especially when you're running them all day. Of course your most power-hungry apps may be different from AVG's list. 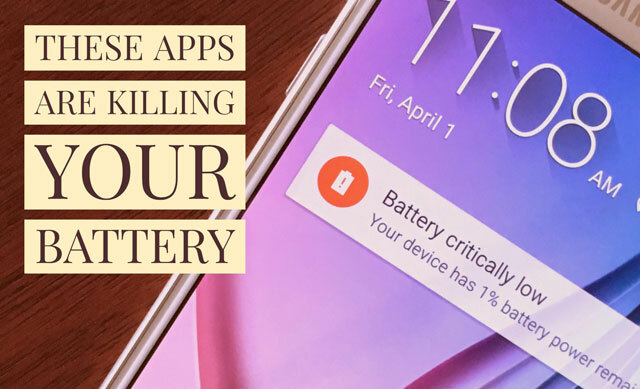 On your Android device, go to Settings > Device > Battery or Settings > Power > Battery to see what's using your smartphone's battery—and then decide whether you really need to use that app as much as you do. For more help making your Android battery last, check out our battery-saving tips. I think your Android phone has to be rooted to remove system apps (like the Samsung ones).